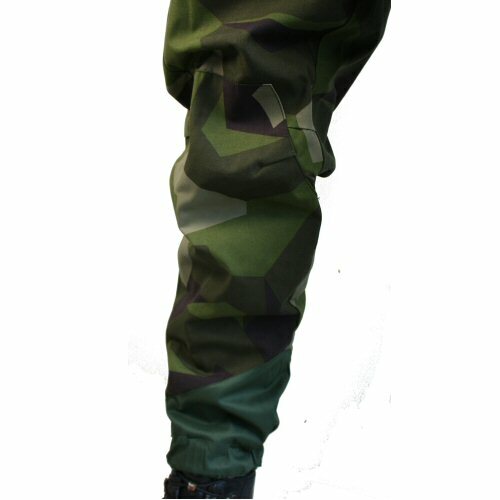 Original Swedish military M90 medium-weight combat trousers, never issued. 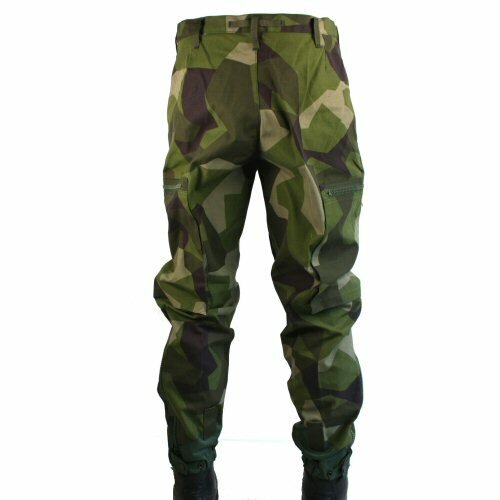 The trousers features distinctive Swedish M90 green tone camouflage in angular shapes. 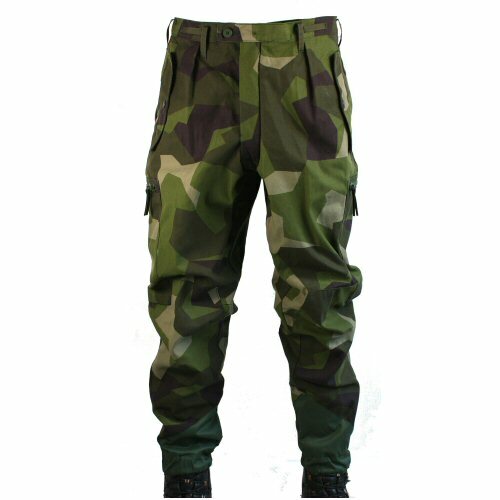 The trousers feature wider seat and hips tapering to narrower lower leg, double button waist and chunky zip fly, pleat front, hip pockets with press button lids, large zippered cargo pockets on leg, shaped knee reinforcement patch, lower leg zippers on left and right legs, Cordura lower legs ending in an elastic ankle cuff with double stage press button studs. 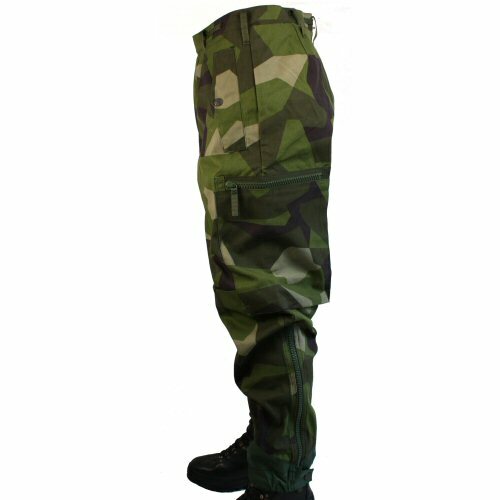 The Cordura lower legs help to make the trousers more resistant to scuffing near the boot. 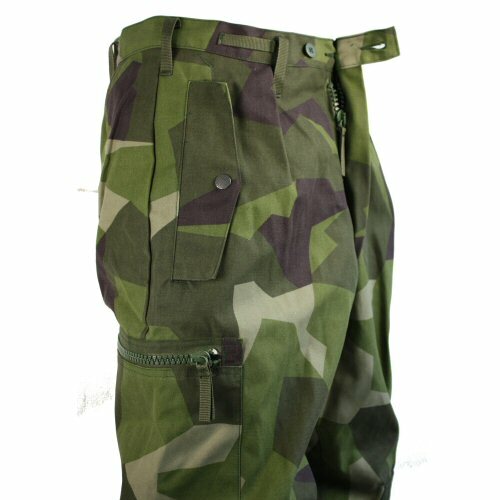 Medium-weight serge fabric is durable and stitched down throughout with double overlock felled seams. 50-50 Cotton Poly. Waist sizes are: 28 in, 32in, 35in, 37in, 40in, inseams are S (28in), R (30in), L (33in). Available options are: 28S , 28XL , 30R , 32R , 32L , 34XXL , 35R , 35XL , 37L , 40L , 40XL , 41.5L , 44L . 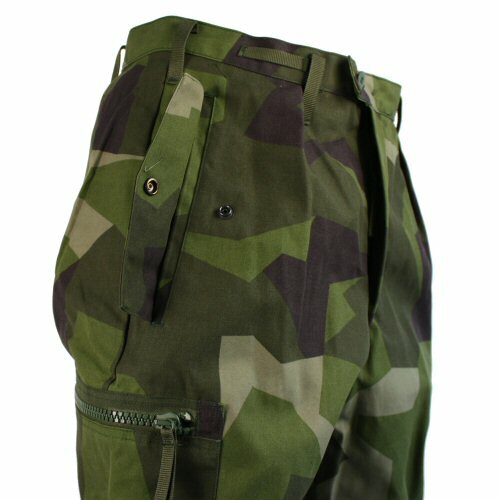 Right hand side of trousers showing the large cargo pocket, hip pocket with flap, lower leg zip and Cordura ankle cuff. The double button waist and zip fly. The hip pocket flap with press stud. 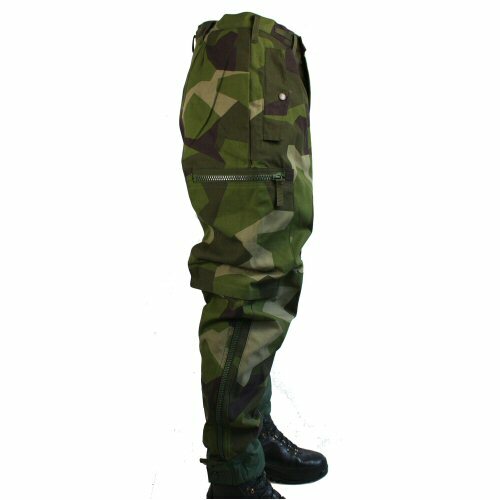 The slower leg features shaped knee and Cordura lower leg cuff terminating in an elastic for a snug fit around the boot.